Today I just want to let you know that the Pinterest Launch Plan by Jennifer Maker is on sale at 25% off for 2 days only. 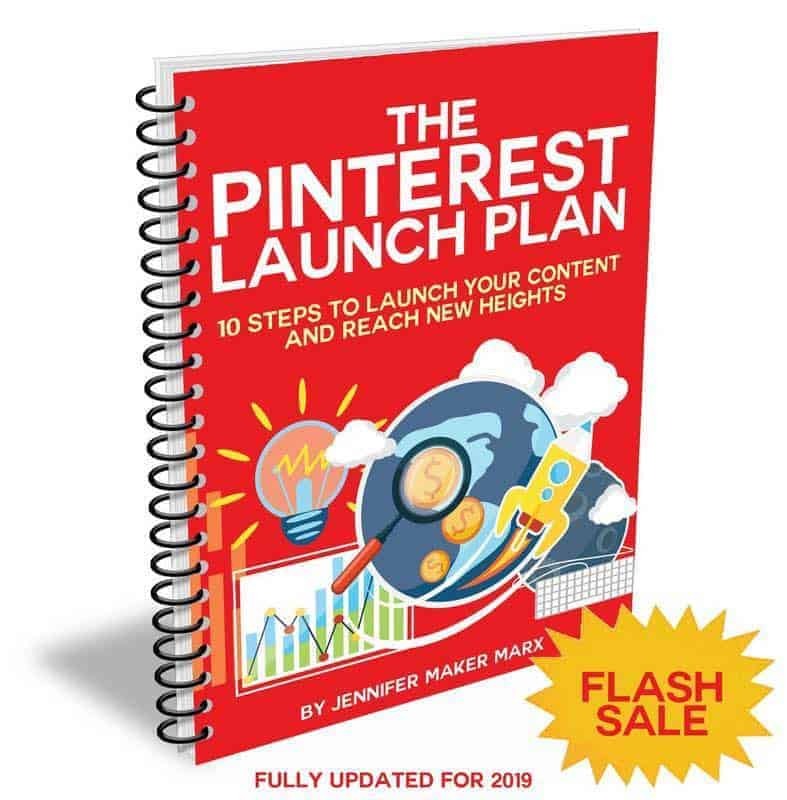 The Pinterest Launch Plan is an eBook and is very reasonably priced even when it is not on sale - so this is a pretty good deal. The eBook is originally $27 but for TWO DAYS ONLY you can grab it for $20. UPDATE: This sale is now over - but watch this space for any updates. I have taken a lot of Pinterest courses over the years because I like to get different perspectives and ideas for strategy. This eBook was particularly interesting for a couple of reasons. First, Jennifer Maker is a powerhouse craft blogger that has grown an audience from zero to - well, I have lost count - but let's just say her blog followers and email list are huge in number. One of the ways that she built her traffic was from Pinterest. So, I figured I could learn a thing or two from her. At first, I was a little skeptical because we all know that crafting and DIY is huge on Pinterest. If you make something interesting, people are going to share it. So, naturally Jennifer had an edge in that area. However for the Pinterest Launch Plan, Jennifer applied her strategy to a brand new Pinterest account that she set up just as an experiment. This account contained mommy blog and parenting type content. Her results were pretty impressive - she grew that account super fast. Since the price of the eBook was so reasonable, I bought it a while ago at full price. I began to implement her strategy and started to see really good results. My own Pinterest account had been sort of stuck. This was around the time that BoardBooster disappeared, so I had just signed up with Tailwind. Keep in mind that personally, I am a little fickle when it comes to following instructions. I am all gung ho at first and then I usually slow down with my implementation. Well, using Jennifer's strategy, my account grew - impressions, followers, and traffic to my site. When I first started - my impressions were about 300k and followers around 1.9k. But, of course, I seem to have deleted the spreadsheet that I was using to track my work. Given my on again off again approach with the Pinterest Launch Plan, I am actually quite pleased with the growth of my Pinterest account. As I said before, the Pinterest Launch Plan is very reasonably priced. Even though it is in eBook format, Jennifer Maker keeps it updated which is important because the only consistent thing about Pinterest is that it keeps changing. Jennifer has put the strategies that she shares into practice with good results. She is also a good teacher and is quite accessible via her Facebook group. If you are looking for a new perspective on Pinterest then the Pinterest Launch Plan would make a good addition to your want to add to your own Pinterest toolbox.